The Observatory for the Protection of Human Rights Defenders, a partnership of the World Organisation Against Torture (OMCT) and FIDH, requests your urgent intervention in the following situation in Guatemala. The Observatory has received information from the Unit for the Protection of Human Rights Defenders in Guatemala (UDEFEGUA) about the criminalisation against Ms. Claudia Virginia Samayoa Pineda, President of UDEFEGUA’s Board of Directors and member of the OMCT Executive Committee, and against Mr. José Manuel Martínez Cabrera, member of the Justicia Ya collective. According to the information received, Ms. Samayoa Pineda and Mr. Martínez Cabrera are facing a criminal complaint made by Mr. Nester Mauricio Vásquez Pimentel, in his capacity as President of the Supreme Court of Justice (SCJ), accusing them of theft, diversion or suppression of correspondence with specific aggravating circumstances and influence peddling. This complaint from the President of the SCJ is a retaliation for a complaint filed by Ms. Samayoa Pineda and Mr. Martínez Cabrera on January 17, 2019, in which they requested that immunity be lifted (preliminary trial request) from 11 judges from the SCJ. The complaint considered that the 11 judges were breaching the Political Constitution of the Republic of Guatemala and committing a crime of prevarication due to their decision of January 9, 2019, to process the request to hold Preliminary Hearing 294-2018 against three judges from the Constitutional Court (CC), as requested by the Association of State Dignitaries (Asociación de Dignatarios de la Nación - ADN). Along with the complaint presented on January 17, 2019, Ms. Samayoa Pineda and Mr. Martínez Cabrera annexed a copy of the SCJ resolution of January 9 which had been widely circulated in the media and on social media. However, despite the fact that this document was in the public domain, the President of the SCJ is accusing these two human rights defenders of obtaining it illegally and of using undue influence to obtain it. The Observatory rejects this criminalisation against Ms. Claudia Virginia Samayoa Pineda and Mr. José Manuel Martínez Cabrera, particularly because of the fact that the President of the SCJ, within his official role, is unduly using criminal law against two human rights defenders. This criminalisation appears to be a form of retaliation against organised civil society and human rights organisations mobilising against attacks on democratic institutions in Guatemala which pose a serious threat to the Rule of Law and to progress in the fight against impunity and corruption in the country, characterised by: repeated disobedience to judicial resolutions; persecution against judges from the Constitutional Court; and the unilateral decision to end the mandate of the International Commission against Impunity in Guatemala (Comisión Internacional Contra la Impunidad en Guatemala - CICIG). The Observatory reiterates its concerns about increasing patterns of persecution and violence against human rights defenders in Guatemala. According to data compiled by UDEFEGUA, in 2018 there were 391 attacks against human rights defenders, including 26 killings and 147 cases of criminalisation. In light of the above, the Observatory calls upon the Guatemalan authorities to immediately and unconditionally cease all acts of harassment, including at the judicial level, against Ms. Claudia Virginia Samayoa Pineda and Mr. José Manuel Martínez Cabrera, and to cease all acts of intimidation against Guatemalan civil society. v. More generally, ensure in all circumstances the respect for human rights and fundamental freedoms in accordance with the Universal Declaration of Human Rights and with international and regional human rights instruments ratified by Guatemala. Please also write to the Diplomatic Representatives of Guatemala in your respective countries. 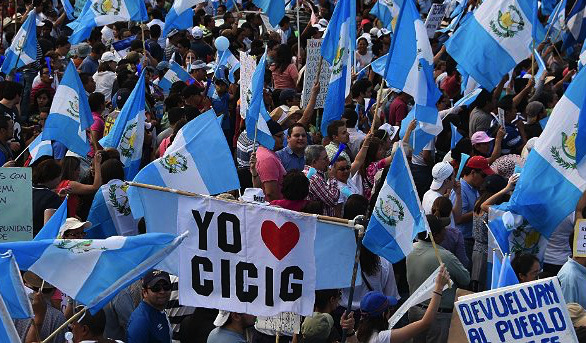 The Justicia Ya collective was founded in April 2015 after the International Commission against Impunity in Guatemala (CICIG) arrested the first members of the criminal structure known as "La Línea", which involved the highest authorities of the Guatemalan state. The collective used social media to organise social mobilisations, which were maintained over 5 months. The collective has maintained a presence in national discussions on issues related to the justice sector, constitutional reforms and deepening of democracy. Nester Mauricio Vásquez Pimentel, Silvia Patricia Valdés Quezada, Nery Osvaldo Medina Mendez, Vitalina Orellana y Orellana, Josué Felipe Baquiax Baquiax, Sergio Amadeo Pineda Castañeda, Ramiro Contreras, Silvia Verónica García Molina, Ranulfo Rafael Rojas Cetina, José Antonio Pineda Barales and Manuel Reginaldo Duarte Barrera. On January 9, 2019, the Plenary of the SCJ declared that there were reasons to admit the request for a preliminary hearing presented by the DNA against three magistrates of the CC, because the CC had exceeded its functions due to its opposition to certain decisions made by President Jimmy Morales in matters of foreign policy and, in particular, by allowing the diplomat Anders Kompass to remain in the country as Ambassador of Sweden. The SCJ thereby violated its duty to guarantee the judicial independence and autonomy of the CC, since, in accordance with the Political Constitution, it is an essential function of the CC to defend the constitutional order and in that function, it acts independently of other State bodies.